Greenway is recalling about 44,000 countertop water dispeners. The internal heating element could overheat and drop molten metal through ventilation openings in the water dispensers base onto the countertop, posing a fire hazard. The internal heating element also poses a shock hazard to consumers who touch it through the vents. Greenway has received one report of a fire involving the recalled countertop water dispenser outside the United States that resulted in property damage. No injuries have been reported. 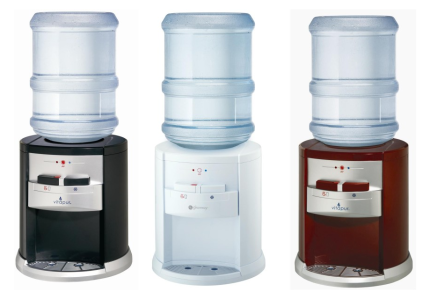 The recalled countertop water dispensers include the following Vitapur, Greenway and Polar models. They dispense hot or cold water and use three or five gallon water bottles. The model name is printed on the front of the dispensers base. Model and serial numbers are printed on a white label on the back of the dispensers base. File number 218326 is printed on a silver sticker on the back of the dispensers base. Model numbers followed by a 1 or 2, (i.e. GWD2630W -1 / PWD2635W-2),or dispensers with no ventilation openings underneath the base are not included in this recall. The dispensers, made in China, were sold nationwide from June 2006 to November 2007 for between $70 and $80. Consumers should stop using the recalled water dispensers immediately and contact Greenway Home Products to receive a free repair. Harley Davidson is recalling 47,579 motorcycles because a fuel-filter shell could crack and cause fuel pressure loss. The recalled bikes are the 2008 FLHP, FLHPE, FLHR, FLHRC, FLHRSE4, FLHT, FLHTC, FLHTCU, FLHTCUSE3, FLHTP, FLHX, and FLTR. "The loss of fuel pressure can cause diminished performance and in some cases may cause an engine stall or a no-start condition," the National Highway Traffic Safety Administration reported. The loss of fuel pressure "could lead to a crash which could cause injury or death," the safety agency warned. Harley Davidson dealers will replace the fuel-filter shell at no charge. Harley owners can contact the company 1-414-343-4056. The Goodman Company is recalling about 30,000 Amana and Energy Knight portable air conditioner/heat pump units because the power cord can overheat, causing a fire hazard. Goodman has received nine reports of smoke or fire associated with the power cords. No injuries have been reported. The recall includes 5.0 kW Amana-brand and Energy Knight-brand PTAC units with model numbers PTC-xxxx-50xx and EKT-xxxx-50x and serial numbers 0702112056 through 0804237539. The model and serial numbers are located on the control board plate found under the PTAC units front cover. The units were sold by Goodman and heating and cooling equipment dealers nationwide from February 2007 through June 2008 for between $700 and $1,000. They were made in the United States. Consumers should contact Goodman to receive a free replacement power cord. Commercial and institutional owners will be contacted directly and will install the power cord. For additional information, contact Goodman at (800) 366-0339 between 8 a.m. and 5 p.m. CT Monday through Friday, or visit the firms Web site at www.regcen.com/ptac. 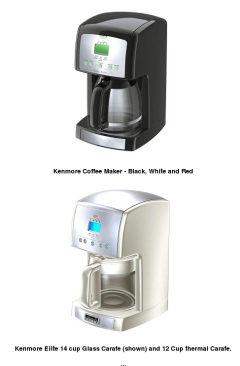 Sears is recalling about 145,000 Kenmore and Kenmore Elite coffee makers. The wiring in the coffee maker can overheat, posing burn and fire hazards to consumers. Sears has received 20 reports of coffee makers overheating, including 12 fires, causing damage to counter tops, cabinet damage, and plastic melting on the floor. No injuries have been reported. The coffee makers, made in China, were sold at Sears, Sears Hardware, the great indoors, and Kmart stores nationwide, as well as Sears.com and Kmart.com, from August 2007 through April 2008 for between $30 and $100. Consumers should immediately stop using the coffee makers and take them to their nearest Sears or Kmart store to obtain a free replacement coffee maker. For additional information, contact Sears at (800) 978-7615 between 7 a.m. and 9 p.m. CT Monday through Saturday, or visit the following Web sites: www.sears.com, www.kmart.com, or www.thegreatindoors.com. Atico International USA is recalling about 124,000 Signature Gourmet and Crofton Personal Blenders. While placing the cup on or off the base of the blender, the blender can be inadvertently turned on, activating the blade. This can pose a serious laceration hazard to consumers. The firm has received 14 reports of lacerations, including 11 that required medical treatment and stitches. This recall involves the Signature Gourmet (item number W14A3691) and the Crofton (model number SB-19) personal blenders. 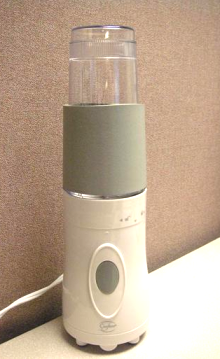 The blenders are white and have 3 components parts a base containing a power button, a blade assembly, and a blending cup. Signature Gourmet or Crofton is printed on the front of the base of the unit. SB-19 or W14A3691 is located on a label at the bottom of the unit. The Signature Gourmet blenders were sold at Walgreens stores nationwide from July 2006 through March 2008 for about $16. The Crofton blenders were sold at Aldi stores nationwide from May 2007 through March 2008 for about $13. They were made in China. Consumers should stop using the recalled blenders immediately and call Atico International USA for instructions on returning the product for a full refund. Consumers should call Atico International USA toll-free at (877) 546-4835 between 9 a.m. and 5 p.m. ET Monday through Friday or visit the companys website at www.aticousa.com. Harbor Freight Tools is recalling about 58,000 Chicago Electric halogen work lights. The lights can overheat and melt, and pose a risk of fire and electrical shock to consumers. There have been three reports of incidents in which the recalled halogen work lights overheated and melted. No injuries have been reported. Description: The halogen work lights are 500 watts. Model number 30858 is included in this recall. The lamp measures 7 inches wide x 5 inches high and is mounted on a yellow frame. 'UL Listed E163392' and 'Work Light 8F95' is printed on a sticker on the back. The model number is printed on the light's packaging. The lights were sold at Harbor Freight Tools stores nationwide, Harbor Freight Tools' catalogs, and at www.harborfreight.com from February 2006 through March 2008 for about $10. They were made in China. Consumers should immediately stop using the halogen work lights and contact Harbor Freight Tools for a full refund. For additional information, contact Harbor Freight Tools at (800) 444-3353 between 8 a.m. and 4:30 p.m. PT Monday through Friday, visit the firm's Web site at www.harborfreight.com. DEWALT is recalling about 14,000 DC608 cordless brad nailes. The nailer can operate when the lock-off (safety) is in the locked position. Also, the nailer can operate when the trigger is not pulled and the contact trip is depressed. The unexpected ejection of a nail poses a serious injury hazard to consumers. DeWALT has received two reports of nailers operating when the lock-off (safety) was in the locked position. No injuries have been reported. 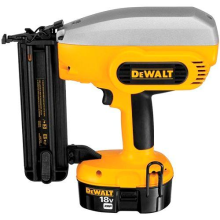 This recall involves the DEWALT DC608 18 Volt Cordless 2' 18 Gauge Straight Brad Nailer with date codes 200728 through 200821. 'DC608' is located on the right side of the magazine. The date code can be found on the underside of the handle, once the battery pack is removed. Units stamped with an 'M' following the date code are not included in this recall. The nailers were sold from October 2007 through May 2008 for about $280. They were made in Mexico. Consumers should immediately stop using the nailers and contact DEWALT for the location of the nearest service center to receive a free repair. For additional information, contact DEWALT toll-free at (866) 220-1481 between 8 a.m. and 5 p.m. ET Monday through Friday, or visit the company's Web site at www.DEWALT.com.